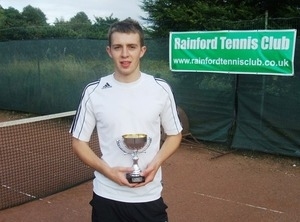 John Machin won the men’s singles title at the 2009 Rainford Tennis Club Tournament beating Andrew Corish in the final 6-3, 6-3. The Gillespie family dominated the remaining events in the competition with Andrew Gillespie beating Conor Porteus in the final of the Boy’s Singles. Andrew then teamed up with younger brother Alex Gillespie to beat Conor Porteus and Joe Machin in the final of the Boy’s Doubles. Andrew and father Alan Gillespie played Lec McKnight and brother Mike Gillespie in the Men’s Doubles Final. The Girls Singles was won by Krystal Connor who beat with Rachel Gillespie in the final.